A last-minute special legislative session? Kansas schools brought back from the edge after being on the brink of closing? How can such things possibly be happening? 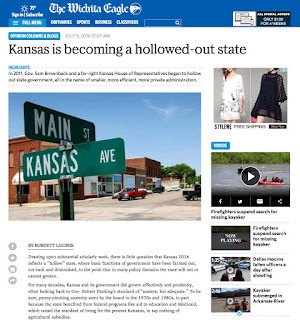 This is Kansas, after all: practical, straight-talking, fiscally conservative, always-be-prepared Kansas. Surely lawmakers must comprehend that Kansans want stability, and want to be reasonably positioned to face future challenges. If the governor and legislators do understand, they have not shown it with their financial management of the state. 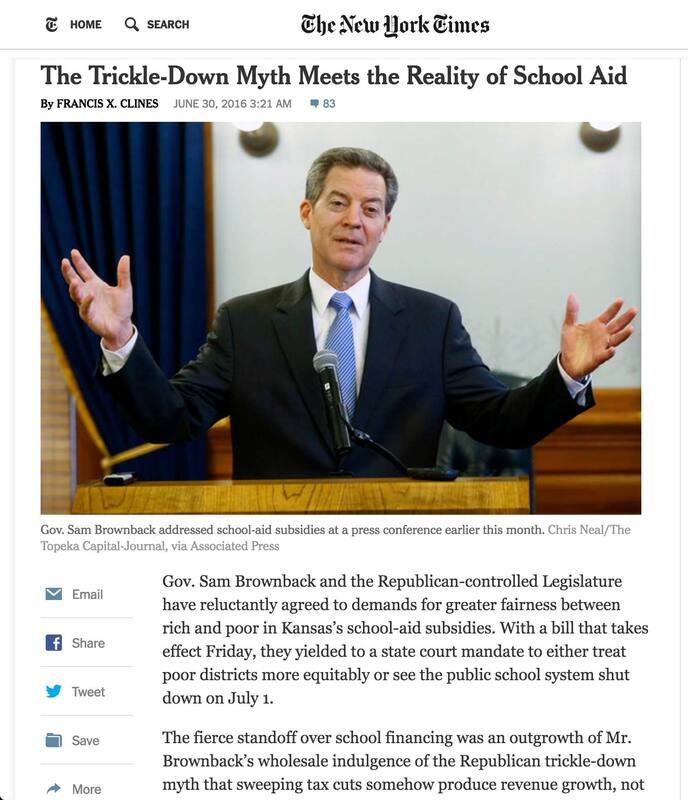 The Brownback fiscal experiment has left Kansas in a highly precarious financial position. A crisis over school funding and a special legislative session are just the latest examples of the chaotic environment born of unaffordable tax cuts. The state’s long-running school finance formula logically called for more money to go to classrooms as costs and enrollments increased. However, with finances in a downward spiral, lawmakers opted to sack the school finance formula and cut funding. Then they froze that lowered aid level in place through a block grant. Of course, without a formula, funding inequities between school districts quickly developed. Don’t blame the Kansas Supreme Court for this. The Court did not create the situation, but rather pointed out that distributing funds inequitably does not meet constitutional muster, and ruled that lawmakers must fix it. If Kansas had retained a properly funded school finance formula, no families would have worried about whether schools would open in August. A special session should never have been necessary. In the crisis atmosphere of a special session, lawmakers managed to add enough money to keep schools open—certainly a positive thing—but by counting on one-time dollars from the hoped-for sale of the Kansas Bioscience Authority. Their solution may last through the November elections, but not much longer. For three years running, Kansas has not received enough revenue to pay bills, leaving the general fund bank account utterly empty. Kansas has a rainy day fund on paper, but without money in it. The highway fund has borrowed to its limits, with road maintenance cut to a fraction of normal, bridge maintenance cut in half, and many construction projects cancelled. Each month, as revenue falls short of expectations, something more must be cut. In March the cuts fell on universities, then on road projects, then on hospitals and doctors who provide Medicaid services, then on the universities again. Finally, to finish the fiscal year at the end of June, the governor simply decided that millions of dollars in bills would go unpaid, pushing them off for payment in a future fiscal year. In January, the next Legislature will face the daunting task of building a new budget in which even a constrained set of expenses outpaces revenue by hundreds of millions. Plus, those future legislators will be saddled with the bills that current legislators and the governor left unpaid this year. What happens when the next recession comes? What happens as roads and bridges continue to deteriorate? What happens as rural hospitals close? What happens as school funding proves to be inadequate? Kansas is ill-prepared to deal with any of it. Scraping by for a time, tapping savings, and using up one-time resources might be justified if those tactics were a bridge to a more permanent solution. But there is no correction in place, no fix ready to kick in. The current financial trajectory leaves Kansas destined to stumble from crisis to crisis, dealing constantly with financial uncertainty. Special sessions. Fights with the Court. Schools on the brink. Unwelcome national publicity. Bills paid late. Waiting lists for services. Deteriorating bridges. Get used to it, Kansans, because this will be our new normal unless we chart a different financial course.